Have you ever noticed a small box asking for your email on a website? That little box is called the “Web Popup”. It usually offers something free to be sent to your email address. Sometimes it may also offer you a discount coupon or a free shipping coupon. It could also be a newsletter subscription box. Actually, modern marketing automation tools let users design web popups in new and innovative ways. We will cover those advanced uses of web popups in the next chapter. First, let’s get introduced to the entire ecosystem of email marketing and see how web popups fit into this ecosystem. This image makes the association between email marketing and web popups very clear. Web popups (sometimes called as “opt-in forms”) are the source element for the Email Marketing of your business. It is a much-loved technique to increase traffic and sales in Internet marketing. All popups work the same; their purpose is to collect email addresses of their visitors for populating an “email list”. This list is then fed into the email marketing system being used by the company. You may also receive a second confirmation mail asking you to verify your email address. Data privacy laws (primarily in the EU) make a second confirmation mandatory. For a marketer, this ensures absolute certainty in the visitor's intent to subscribe; they want their emails to be delivered to people who want it the most. Once you are in their email list, they will use it to send you important pieces of content as well as marketing offers. They get to stay in touch with you even after you leave the website. Marketers collect emails to keep the conversation going with their customers after their initial visit. If you use email marketing for your online business, you should focus on using the web popup, as more than just a subscription box. Depending on where your customers are in the marketing funnel, you can send them different types of emails. A sustained dialogue over emails to engage with leads is one of the primary ways of staying in touch with them. We hope that these leads turn to customers one day. However, you can’t make customers open these unless you know what they like. The process of tweaking the subject lines, graphics inside the email, and the copy (content) of the email is called Email Marketing Optimization. The goal of this process is to make your leads relate to your emails more naturally. The more relatable your email content is for your customers, the more engagement and conversion it draws. 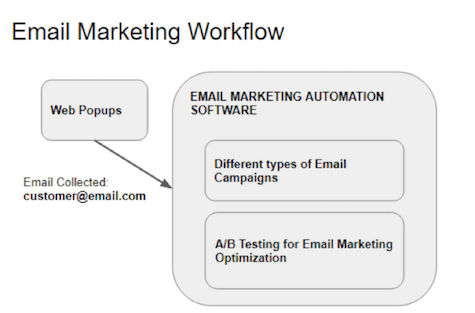 An A/B test is an optimization technique involving different variations of email elements to see which one resonates the most with the audience. Different emails (for the same purpose) are sent to different sets of users. Whichever generates most engagement and sales, is used for the whole segment of the email list. A marketing automation software typically automates both these processes. It also gives steady support in the form of customizable templates for designing the web popups. All marketing automation software provide creation of web popups. In some tools they are called "Opt-in Forms", while few others call it "Lead Generation Forms". You can customize a template for creating an opt-in form. Sometimes, the web popup can be seen on your first visit, sometimes it is located on the sidebar. Exit Popups, that are shown as you try to close the tab, are also pretty popular. A new type of very unique popup is called “time-triggered” popup - it shows up after you scroll down a certain length or after you have spent a certain time on a webpage. We will see all these types in great detail in the next chapter!